Explore os destaques de Berlim nesta excursão de dia inteiro de ônibus saindo de porto do cruzeiro de Warnemünde. Ao chegar em Berlim, faça uma excursão de 5,5 horas a locais de interesse significativos, como Checkpoint Charlie, Reichstag, e o Portão de Brandenburg. Desfrute de comentários informativos do seu guia a bordo e saiba mais sobre a história da capital alemã. We so glad to take this tour, tour guide is very knowledgeable and patient. The bus driver is efficient !I highly recommend this tour to my friends and family! Great tour guide and enjoyable tour. 4 forgetful clients were late for more than 40 minutes and required Ulkotours to phone them. This greatly reduced our lunch/visiting hours. Overall, I think that 3 hours' drive per journey is not worthwhile. The guide did not urge us to pay him gratuity and because he did not go back to the dock with us, we missed the chance to do so. This was a 12 hour excursion from Warnemunde/Rostock Germany as our cruise ship was in port for 15 hours. Sam who was from the UK and has lived in Berlin for the past six year was one of the best tour guides I've ever had on any viator or Cruise excursion tours. He was very knowledgeable but knew how to communicate to all levels of audience. The places we visited were all awesome! The bus ride from the port to Berlin was about 3.5 hours each way but luckily we were in a brand new bus and had an awesome driver as well. I highly recommend this tour. Make sure to bring water and some snacks with you. Good value for money hitting all of the sites one has always heard about. Boris, our American born guide, was very informative and gave us historical background on each site we visited. In addition to the background on the sites, Boris gave us a glimpse of the change in German thought after WW!!. He carefully kept track of the group and pressed us so that we were able to visit all of the highlights in the brochure. Boris made our trip to Berlin one of the best excursions we have ever had. Very informative, fun, and knowledgeable on Berlin. Even with the long ride to and from the pier to the city we were able to cover all the highlights of this amazing city. Excellent, knowledgeable guide, kept things moving and all on the tour on time! With so much to cover we did not feel rushed and was happy that the tour concentrated on seeing as much as possible without wasting too much time for lunch or shopping!!! This is a very good tour of Berlin. Know though that it's a 3 hour bus ride from the port to Berlin and another 3 hours back. You will see farmland and that's about it on the way. They stop coming and going half way for a restroom break. 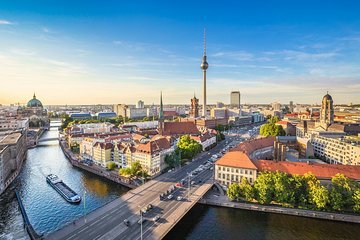 The tour in Berlin takes in all the sites as detailed in the description on the web. Wonderful tour. Guide was so informed and knowledgeable. Saw everything I needed to see. Amazing experience!